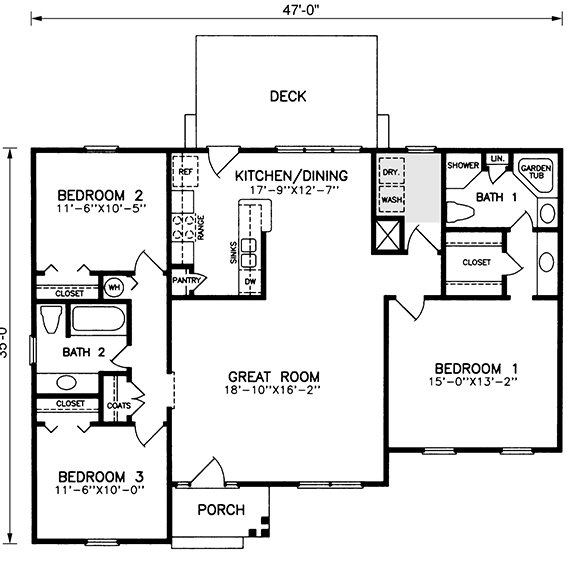 This attractive, economical three-bedroom ranch design offers over 1,400 square feet of heated area within its compact footprint. 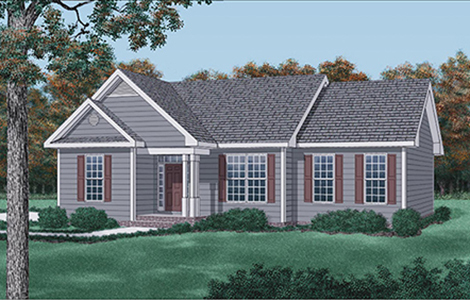 Special features of the Autumn: Double gable and porch with triple columns and sidelights accenting the front entry. Open layout of great room and kitchen/dining areas enhances spacious feeling. Nine-foot ceilings throughout. Compact kitchen serves dining area and adjoins backyard deck Private master bedroom (located opposite other bedrooms for privacy) offers walk-in closet, dressing area, two vanities, and full bath with separate shower and garden tub Bedrooms 2 and 3 share access to second full bath.